1997 NHL All-Star Game (San Jose) embroidered cap autographed on the bill by three time Stanley Cup winner and future Hall of Famer Mark Recchi. 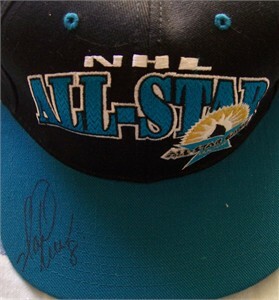 Obtained in person at Mario Lemieux Celebrity Golf Tournament many years ago. With certificate of authenticity from AutographsForSale.com. ONLY ONE AVAILABLE FOR SALE.